The fashion industry has been slow to adapt to new technologies, says Bitonti, who warned: "Fashion brands are going to have to adapt to this, which is going to mean a shift in core values for many brands." The New York-based designer initially trained as an architect but has recently focussed on applying advanced manufacturing techniques to fashion, jewellery and accessories, including a 3D-printed dress for Dita von Teese and a pair of 3D-printed shoes. "We want to redevelop everything from design methodology to material and form, to distribution and production," he said. "This technology is going to turn the entire industry inside out." 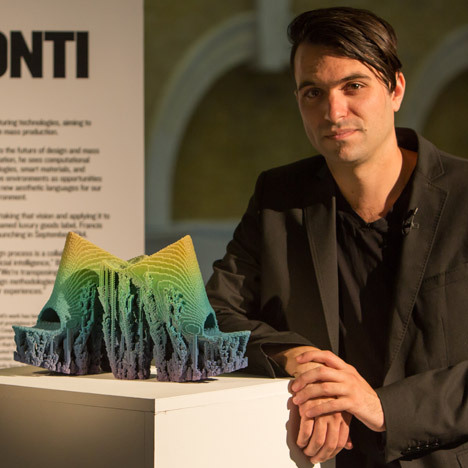 Bitonti berated the mainstream fashion industry for not being quicker to embrace technology. "Adoption has been slow and it's many years behind other industries. I hope they catch up soon," he said. The designer also hit out at wearable-tech products: "It's a watch that tells you how many steps you are taking, who cares?" "I don't want technologies that integrate with my body, I want clothing and accessories that makes my body do things and feel things I have never thought I was capable of," he said. Dan Howarth: What benefits has the fashion industry gained from digital technology so far? Francis Bitonti: I am still waiting for the fashion industry to embrace technology in a meaningful way. Aside from performance-oriented wearable products and brands, I am not seeing an intrusion of technology that is influencing design methodology and thereby having a meaningful impact on the way we think about clothing. I hope my reply does not sounds negative but the first step is transform design methodology. We don't even have this conversation happening in fashion right now. All the software I am seeing only digitises traditional workflows. Before we can have meaningful conversations about new production technologies and materials, we need to be embracing digital design processes as an artistic medium and not an environment for engineering and optimisation. Dan Howarth: What are the most important digital technologies currently used in fashion? Francis Bitonti: I don't think digital technologies have been widely adopted yet by the industry. I don't think it's the fault of the designers, to be honest good digital tools don't exist yet for the industry. The only digital design tools have nothing more to offer beyond what we can do with traditional design methods. I myself have been forced to use CAD tools designed for the animation industry. Dan Howarth: How will digital technology benefit the fashion industry in the near future? Francis Bitonti: The most important thing that has happened to humanity since fire and the wheel is the search engine. The search engine thrust us out of a psychology of hierarchies and linear structures and into a distributed adaptable soup that mirrors our desires. We are a search civilisation. I will never forget the first time I used Google, a blank page onto which you project your desires and your world is built before your eyes on your request. Our media, movies, music books etc, have all gone been forced to adapt to this world view. We are now undergoing a hardware revolution, the digitisation production processes and design files will take advantage of this infrastructure. This is going to be the biggest challenge for fashion brands to contend with moving forward. How will an industry where value is communicated by exclusivity and craft cope with this new space? If they hope to capture millennials they will have to adapt. It's not about exclusion anymore it's about individualisation and co-creation. Fashion brands are going to have to adapt to this, which is going to mean a shift in core values for many brands. Dan Howarth: What about biological materials and processes? How are they influencing the way we design clothes? Francis Bitonti: Everyone is very excited about biological materials and processes right now. To be honest I am not. I don't see it being scaleable in a responsible way if this trend continues I see the factories becoming a toxic nightmare combining all the problems of industrial farming with industrial manufacturing. The avant garde of which I consider myself part of always makes this mistake. It's speculation for the sake of speculation, it's a beautiful story but I don't see anything other then science fair tricks being done in this space right now. Please make infrastructure not trinkets. We don't live in a time for concepts and drawings. It's a democratic time and everyone can shape the flows of material production and commerce. I would be thrilled to see one of these projects stop hiding behind the gallery system, step out into the world and try to initiate change. It is your duty as a designer, let artists make art. Designers change the way the world works. Designers must have a conversation with commerce and manufacturing. Cotton and leather are biological materials, I agree these materials work well but certain problems have come with industrial-scale harvesting and I'm not seeing any solutions for that. I am just seeing more of the same, just less expected, biological materials. We are simply continuing this harvest mentality. I don't see any big ideas being explored in this space. I am interested in synthetic biology. This is a relatively new human capability that will allow us to move beyond harvesting matter and designing matter. We live in a time of language, I am not interested in anything that can not be codified in some linguistic fashion. This is why I work with 3D printing, we have g-code: a codified language for material production. The internet was a revolution because under it all was a codified linguistic method of creation and reproduction. Synthetic biology has this potential and I think the results will be amazing as designers begin to explore this space. I am very interested to have the studio move into the space in the near future. Dan Howarth: How will clothes and accessories become more integrated with the body? Francis Bitonti: I don't want to see this happen. This is what I am seeing technology do for fashion design right now. People working in wearable tech are particularly guilty of this. It's a watch that tells you how many steps you are taking, who cares? I want more conflict with the body. This is always a danger when designers get into tech, they think they need to optimise. I think they get insecure. I've seen too many movies set in the future with everyone walking around in a wetsuit coved with lights. No one is inspired by the path of least resistance, technology is about giving humans new capacities. I don't want technologies that integrate with my body, I want clothing and accessories that makes my body do things and feel things I have never thought I was capable of. We learn the most from contradiction. The greatest moments in the history of fashion have been fuelled by conflict. Showing us a silhouette we have never imagined a human body can take or some controversial re-appropriation of a vernacular formal and material language. Designers need to stop thinking about how the future is going to save us. Let us see what our new capacities will be for better or worse. Technology expands what we can do and what we can make, if we want to keep evolving I hope we will use these technologies to produce more contrast and continue to show us the unseen. Dan Howarth: What developments are you currently working on that bridge technology and fashion? Francis Bitonti: We are very focused on 3D printing and additive manufacturing. We have abandoned all other material production for the time being. Our project is a big one. We want to redevelop everything from design methodology to material and form to distribution and production. This technology is going to turn the entire fashion industry inside out. Dan Howarth: Has the fashion industry accepted technology yet? Francis Bitonti: Adoption has been slow and it's many years behind other industries. I hope they catch up soon. I can't wait to see what such a vibrant creative community can do with all we have available to us right now.